A new keyboard designed with late-night bloggers in mind is considerably quieter than your average QWERTY, ideal for those who wish to write quietly into the early hours. 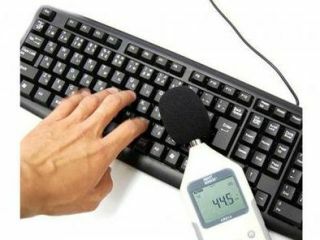 Thanko's Silent Keyboard EX claims that the noise emitting from the tap-tapping on its keys is down to 44.5 dB, which equates to a whole 16.5 dB quieter than an average keyboard. Other than that, it's pretty much what you would expect: a full-sized USB keyboard with 12 function keys and number pad and fully compatible with Windows 2000, XP and Vista and Mac OS X 10.5 and later. Late-night bloggers and fans of silence can buy the Thanko Silent Keyboard EX from GeekStuff4U for JPY4,980.00 (£34).